The Jewish custom of saying LeChayim (or lechaim/ lekhayim/ lekhaim/ l'chayim/ l'chaim/ l'khayim/ l'khaim) לחיים is very well known, and popularized by the song from Fiddler on the Roof "To Life. " What is the origin of the phrase? It is common among Sefardi families (and now more and more amongst Askhenazim) that before the blessing on the wine during kiddush, the person making the blessing will say סברי מרנן "savri maranan" and those listening will respond lechayim. Some people will confuse savri with another introduction to similar blessings - b'rshut ברשות - meaning "with [your] permission". However, savri has a different meaning altogether. 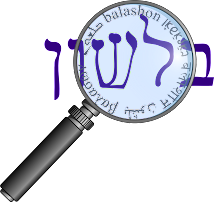 It comes from the root סבר, which means "to think, be of opinion". This is the also the root of the verb l'hasbir להסביר - to explain and svara סברה - logical argument. Therefore, the phrase savri maranan actually translates to "Gentlemen, what is your opinion?" What does this have to do with drinking wine? We find the answer in Midrash Tanchuma, Parshat Pekudei (Siman 2) . It is discussing the procedure of interrogating and potentially executing someone accused of a capital crime. וכששבין מלחקור, אומר להם, סברי מרנן. והם אומרים, אם לחיים לחיים, ואם למיתה למיתה. אם הוא מחויב סקילה, מביאין לו יין טוב וחזק ומשקין אותו, כדי שלא יצטער מן הסקילה. "After they return from the investigation, one says to them 'savri maranan (have the gentlemen formed an opinion)?' And they say, if to life lechayim - to life, and if to death, lemavet - to death." And if he is sentenced to stoning, they bring him strong good wine to drink, and have him drink it, so he won't suffer during the stoning. " וכן שליח צבור כשיש בידו כוס של קדוש או של הבדלה , והוא אומר סברי מרנן, ואומר הקהל לחיים, כלומר כי לחיים יהא הכוס. "And so also the Shaliach Tsibur (= cantor) when he has a cup of kiddush or havdala in his hand and he says 'savri maranan', and the congregation says lechayim - to life, as to say that the cup will be to life."